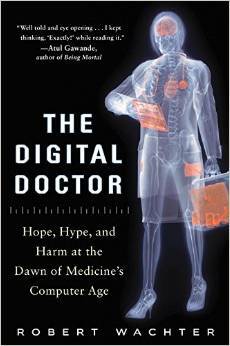 If you are interested in digital health, please read this book! Here are some quotes which I found thought-provoking. While computers are preventing many medical errors, they are also causing new kinds of mistakes, some of them whoppers. Sensors and monitors are throwing off mountains of data, often leading to more confusion than clarity. How could one of America’s leading hospitals (my own) give a teenager a 39-fold overdose of a common antibiotic, despite (scratch that—because of) a state-of-the-art computerized prescribing system? “But I realized that most of my time was spent moving information from one place to another, doing what we in computer science would call ‘simple transforms’”—like transforming the fact that a patient was on insulin, which lived on a medication list, into “diabetes mellitus” on a different page, the problem list. “Medicine is the most information-rich, knowledge-intensive human activity, probably ever,” he said. “I was angry, because I knew that there were technological solutions to these problems, and we weren’t using them.” After receiving advanced training in informatics1 at the Regenstrief Institute in Indianapolis, he took a position at Mayo, where he is now one of dozens of doctors, nurses, and pharmacists working to bridge the worlds of clinical medicine and information technology. Computerized ordering would make a doctor’s handwriting as irrelevant as scratches on a record album. Computerized decision support would alert the doctor or pharmacist that the patient was allergic to the medication being ordered, or that two medications might interact dangerously. A pharmacy robot could ensure that the right medication was pulled off the shelf, and that the dose was measured with a jeweler’s precision. And a bar-coding system would render the final leg in this relay race flawless, since it would signal the nurse if she had grabbed the wrong medication or was in the wrong patient’s room. Abundant research has demonstrated that the term multitasking is a misnomer—performance degrades rapidly when people try to do several things simultaneously. Psychologists speak of the concept of “cognitive load”—the overall volume of things a mind is grappling with at a given time. Whether on the floor of an automobile manufacturing plant or a pediatrics ward, the central question in safety is whether a worker will “stop the line”—not just when she’s sure something is wrong but, more important, when she’s not sure it’s right. Safe organizations actively nurture a culture in which the answer to that second question is always yes. “Patients possess a body of knowledge about themselves that we can never hope to master, and we have a body of knowledge about medicine that they can never hope to master. Our job is to bring these two groups together so we can serve each other well. Litmus test for the computerization of medicine. “The first and foremost question is, to what degree will technology distance us from patients, and to what degree will it bring us closer to them,“Software development is like the practice of medicine, parenting, and marriage,” said Zeiger. “They’re all fundamentally about respect. It’s disrespectful to patients not to allow them to co-own their own agenda.